"Aquitania" redirects here. For other uses, see Aquitania (disambiguation). Gallia Aquitania (/ˈɡæliə ˌækwɪˈteɪniə/; Latin pronunciation: [ˈɡalːia akᶣiːˈtaːnia]), also known as Aquitaine or Aquitaine Gaul, was a province of the Roman Empire. It lies in present-day southwest France, where it gives its name to the modern region of Aquitaine. It was bordered by the provinces of Gallia Lugdunensis, Gallia Narbonensis, and Hispania Tarraconensis. Fourteen Celtic tribes and twenty Aquitanian tribes occupied the northern parts of the Pyrenees and, from the country of the Cemmenus to the ocean, bounded by two rivers: the Garumna (Garonne) and the Liger (Loire). The major tribes are listed at the end of this section. There were more than twenty tribes of Aquitani, but they were small and lacking in repute; the majority of the tribes lived along the ocean, while the others reached up into the interior and to the summits of the Cemmenus Mountains, as far as the Tectosages. The name Gallia Comata was often used to designate the three provinces of Farther Gaul, viz. 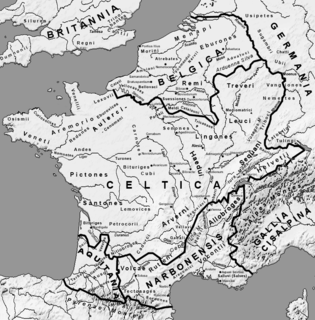 Gallia Lugdunensis, Gallia Belgica, and Aquitania, literally meaning ‘long-haired Gaul’, as opposed to Gallia Bracata ‘trousered Gaul’, a term derived from bracae (‘breeches’, the native costume of the northern ‘barbarians’) for Gallia Narbonensis. Most of the Atlantic coast of the Aquitani was sandy and thin-soiled; it grew millet, but was unproductive with respect to other products. Along this coast was also the gulf held by the Tarbelli; in their land, gold mines were abundant. Large quantities of gold could be mined with a minimum of refinement. The interior and mountainous country in this region had better soil. The Petrocorii and the Bituriges Cubi had fine ironworks; the Cadurci had linen factories; the Ruteni and the Gabales had silver mines. According to Strabo, the Aquitani were a wealthy people. Luerius, the King of the Arverni and the father of Bituitus who warred against Maximus Aemilianus and Dometius, is said to have been so exceptionally rich and extravagant that he once rode on a carriage through a plain, scattering gold and silver coins here and there. The Romans called the tribal groups pagi. These were organized into larger super-tribal groups that the Romans called civitates. These administrative groupings were later taken over by the Romans in their system of local control. Aquitania was inhabited by the following tribes: Agesinales, Ambilatri, Anagnutes, Arverni, Ausci, Autobroges, Basabocates, Belendi, Bercorates, Bergerri, Bipedimui, Cadurci, Cambolectri, Camponi, Cocossati, Consoranni, Cubi, Elui|, Elusates, Gabales, Latusates, Lemovices, Mandubii, Monesi, Nitiobriges, Onobrisates, Osquidates, Osquidiales, Petrocorii, Petrogoti, Pictones, Ruteni, Ruthenes, Santoni, Sassumini, Sediboniates, Sennates, Sibyllates, Sottiates, Succasses, Tarbelli, Tolosanes, Uliarus, Vassei, Vellates, Vellavii, Venami, Veneti (Veneticæ), Vibisci, Vornates. Gaul as a nation was not a natural unit (Caesar differentiated between proper gauls (Celtae), Belgae and Aquitani). In order to protect the route to Spain, Rome helped Massalia (Marseille) against bordering tribes. Following this intervention, the Romans conquered what they called Provincia, or the ‘Province’ in 121 BC. Provincia extended from the Mediterranean to Lake Geneva, and was later known as Narbonensis with its capital at Narbo. Some of the region falls into modern Provence, still recalling the Roman name. The main struggle (58–50 BC) against the Romans came against Julius Caesar under Vercingetorix at Battle of Gergovia (a city of the Arverni) and at the Battle of Alesia (a city of the Mandubii). The Gaulish commander was captured at the siege of Alesia and the war ended. Caesar seized the remainder of Gaul, justifying his conquest by playing on Roman memories of savage attacks over the Alps by Celts and Germans. Italy was now to be defended from the Rhine. Caesar named Aquitania the triangle shaped territory between the Ocean, the Pyrenees and the Garonne river. He fought and almost completely subdued them in 56 BC after Publius Crassus's military exploits assisted by Celtic allies. New rebellions ensued anyway up to 28-27 BC, with Agrippa gaining a great victory over the Gauls of Aquitania in 38 BC. It was the smallest region of all three mentioned above, following that a land extension stretching to the Loire River was added by Augustus, with the council of the gaulish aristocracy. This reorganization took place after the census conducted in 27 BC, based on Agrippa's observations of language, race and community according to some sources. At this point, Aquitania along with Narbonensis, Lugdunensis and Belgica now made up Gallia and became an imperial province. Aquitania lay under the command of a former Praetor, and hosted no legions. More so than Caesar, Strabo insists that the primeval Aquitani differ from the other Gauls not just in language, institutions and laws ("lingua institutis legibusque discrepantes") but in body make-up too, deeming them more close to the Iberians. The administrative boundaries set up by Augustus comprising both proper Celtic tribes and primeval Aquitani remained unaltered until Diocletian's new administrative reorganization (see below). The Arverni often warred against the Romans with as many as two to four hundred thousand men. Two hundred thousand fought against Quintus Fabius Maximus Aemilianus and against Domitius Ahenobarbus (Domitian). The Arverni not only had extended their empire as far as Narbo and the boundaries of Massiliotis, but they were also masters of the tribes as far as the Pyrenees, and as far as the ocean and the Rhenus (Rhine). Early Roman Gaul came to an end late in the 3rd century. External pressures exacerbated internal weaknesses, and neglect of the Rhine frontier resulted in barbarian invasions and civil war. For a while Gaul, including Spain and Britain, was governed by a separate line of emperors (beginning with Postumus). However, there had still been no move to gain independence. In an attempt to save the Empire, Diocletian reorganized the provinces in 293, with the establishment of the Diocesis Viennensis in the south of Gaul, comprising the former Gallia Aquitania and Gallia Narbonensis. At the same time, Aquitania was divided into Aquitania Prima, with its see (capital) in Avaricum Biturigum (Bourges), Aquitania Secunda (see – Burdigala; the later Bordeaux) and Aquitania Tertia, better known as Novempopulania ("land of the nine peoples"), with its see in Elusa (Eauze). Novempopulania originated in boundaries set up by Caesar for the original Aquitania, who had kept some kind of separate sense of identity (Verus' mission to Rome aimed at demanding a separate province). After this restructuring, Gaul enjoyed stability and enhanced prestige. From 395, the division of the empire between eastern and western rulers again caused the neglect of the Rhine frontier, reflected in the transfer of the Gallic prefect to Arelate (Arles). In the early 5th century, Aquitania was invaded by the Germanic Visigoths. The Emperor Flavius Honorius conceded land in Aquitania to the Visigoths . According to some sources, these particular Visigoths were Roman foederati and Flavius acted to reward them under the principle of hospitalitas (i.e. the Roman legal framework under which civilians were required to provide quarters to soldiers). However, in 418, an independent Visigothic Kingdom was formed from parts of Novempopulania and Aquitania Secunda. The death of the general Aëtius (454) and a worsening debility on the part of the western government created a power vacuum. During the 460s and 470s, Visigoths encroached on Roman territory to the east, and in 476, the last imperial possessions in the south of Aquitania were ceded to the Visigoths. The Visigothic Kingdom later expanded over the Pyrenees and into the Iberian Peninsula. From 602, an independent Duchy of Vasconia (or Wasconia) was formed, under a Frankish-Roman elite, in the former Visigothic stronghold of south-west Aquitania (i.e. 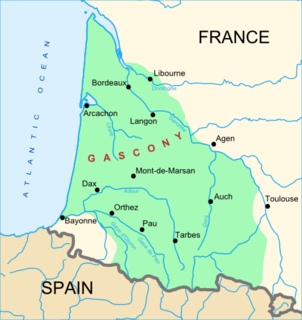 the region known later as Gascony). ^ a b c John Frederick Drinkwater (1998). "Gaul (Transalpine)". The Oxford Companion to Classical Civilization. Ed. Simon Hornblower and Antony Spawforth. Oxford University Press. Oxford Reference Online. ^ a b c Strabo: The Geography, The Aquitani. ^ The Fourth Book of the History of Nature, C. Pliny. ^ Caro Baroja, Julio (1985). Los vascones y sus vecinos. San Sebastian: Editorial Txertoa. p. 129. ISBN 84-7148-136-7. ^ Matthew Bunson (1994). Encyclopedia of the Roman Empire. Facts on File, New York. p. 169. ^ Caro Baroja, Julio (1985). Los vascones y sus vecinos. San Sebastian: Editorial Txertoa. p. 127. ISBN 84-7148-136-7. ^ P. Heather. (1996). The Goths, Blackwell Publishers, Oxford. ^ H. Sivan. (1987). "On Foederati, Hospitalitas, and the Settlement of the Goths in AD 418", American Journal of Philology 108 (4), 759-772. The Battle of Alesia or Siege of Alesia was a military engagement in the Gallic Wars that took place in September, 52 BC, around the Gallic oppidum of Alesia, a major centre of the Mandubii tribe. It was fought by the army of Julius Caesar against a confederation of Gallic tribes united under the leadership of Vercingetorix of the Arverni. It was the last major engagement between Gauls and Romans, and is considered one of Caesar's greatest military achievements and a classic example of siege warfare and investment. The battle of Alesia marked the end of Gallic independence in France and Belgium. Gallia Narbonensis was a Roman province located in what is now Languedoc and Provence, in southern France. It was also known as Provincia Nostra, from its having been the first Roman province north of the Alps, and as Gallia Transalpina, distinguishing it from Cisalpine Gaul in northern Italy. It became a Roman province in the late 2nd century BC. Its boundaries were roughly defined by the Mediterranean Sea to the south and the Cévennes and Alps to the north and west. The western region of Gallia Narbonensis was known as Septimania. The Via Aquitania was a Roman road created in 118 BC in the Roman province of Gaul. 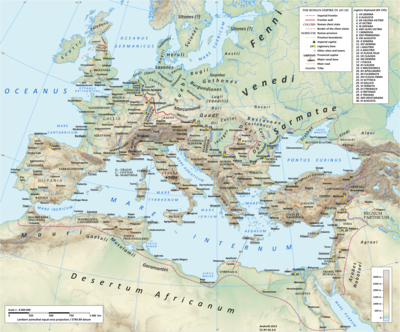 It started at Narbonne, where it connected to the Via Domitia. It then went toward the Atlantic Ocean, via Toulouse and Bordeaux, covering approximately 400 kilometres (250 mi). 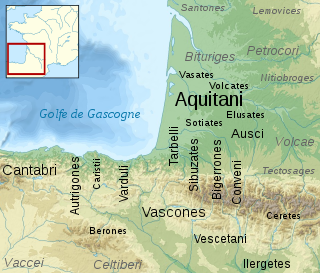 The Cocosates were an Aquitani pre-Roman tribe settled in what today is southwestern France, at north of the river Adour. They were surrounded by the Tarbelli at south and the Boiates at north. They inhabited what today is the western part of the French department of Landes.